Choose from 811 boats in Caribbean. 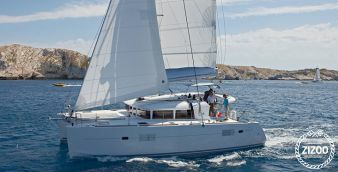 The Caribbean islands are having an impressive comeback as a popular destination for yacht charters and boat holidays. 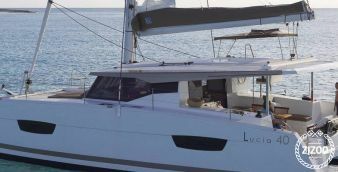 The process of renting a yacht or catamaran in the Caribbean has never been easier than today. Plus chartering a boat in the Caribbean offers a new spin on classic destinations. ⚓ With a boat rental, you can discover uninhabited small islands to spend in complete tranquility or hop around buzzing ports filled with amazing cuisine and musical entertainment. The Caribbean is unsurprisingly one of the most popular boat rental destinations in the world with an embarrassment of riches to offer. A Caribbean boat rental offers you a unique and convenient way to experience this haven of crystal-clear water, white sand and palm trees. Why? A Caribbean yacht charter offers you private access to some of the most incredible hidden-away places that can only be reached by boats and yachts often year round. Some of the most stunning, secluded beaches in the world are found in the Caribbean, which is only reachable when you charter a boat. So whether you’re looking to rent a catamaran, charter a sailboat, or book a motorboat, we have the right boat for your Caribbean vacation. 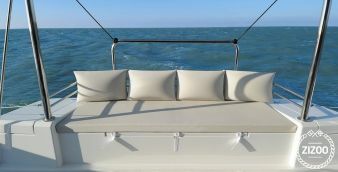 Renting a catamaran offers you the freedom and the luxury to make your sailing holiday an unforgettable experience. 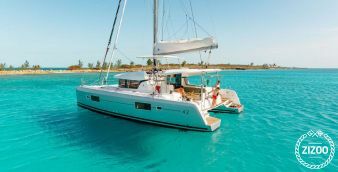 So often the magic of a trip lies in the offbeat, intimate discoveries that feel like they were waiting just for you but the ultimate experience is when you rent a catamaran in the Caribbean. Plus a catamaran is a killer way to travel to these diverse pristine lands. The Caribbean as an ideal choice for sailing due to its calm crystal-clear waters, which also makes it the most favorable for watersports such as swimming, snorkeling, and diving. Embrace your dream of having a more adventurous experience hopping around the Caribbean islands on a yacht. Martinique is one of the Caribbean’s most treasured destinations for sailors and first-time boaters alike. The ‘Paris of the Caribbean’ is famous for its interesting mix of French and West Indian culture, exquisite cuisine, picture-perfect beaches, including the most amazing volcanic black sand beaches, lush rainforests, and rugged peaks. Martinique is an amazing sailing destination to gleefully swim with turtles during a snorkeling or diving excursion. If your idea of an unforgettable vacation involves picture-perfect beaches, then the island of Martinique is for you. Where to rent a boat in Martinique? Our boat rental in Martinique counts over 200 boats to choose from. 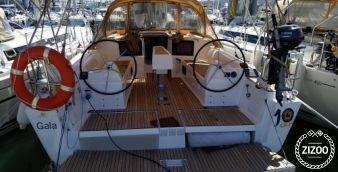 A fantastic way to yacht charter in Martinique is to set sail from the bustling capital, Fort-de-France, after indulging in its tantalizing cuisine, of course, and heading toward Martinique’s mesmerizing island scenery on your yacht charter. The ultimate sailing spot to charter a boat in Martinique, however, is the beautiful seaside town of Le Marin. It boasts wonderful waterfront restaurants, beautiful white houses, and a bustling, fully-equipped marina. Known as the yachting capital of Martinique, Le Marin is the perfect spot to charter a yacht and explore the island’s coastal treasures. 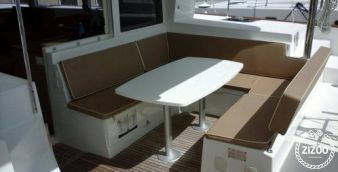 When to yacht charter in Martinique? This exotic French isle has a climate which is ideal for sailing all year round. Chartering in Martinique gives you the optimal way to explore this volcanic and luscious natural marvel. The island hosts many sailing and yachting events throughout the year which attracts thousands of seamen and globetrotters, such as the Yole Boat Race in August, the Transcaraïbe des Passionnés boat race in March, and the Schoelcher Nautical Week in February. In Martinique, you can spend your time sailing the waters of the Caribbean Sea or, for the more experienced sailor, the Atlantic Ocean. The north of the island is covered in rainforest hillsides, and in the south, you’ll find beautiful bays and lovely beaches, which are often preferred for snorkeling and diving. Martinique’s location also makes it the ideal starting point for a one way sailing holiday across the short stretch of water to St Lucia and down through the Grenadines. A veritable sailor’s paradise, the British Virgin Islands (BVI) offers one of the world’s foremost sailing destinations with over 50 islands that are best explored when you rent a boat in BVI. Rent a boat and plan your holiday in this beautiful part of Caribbean archipelago on our page about BVI. Where to go during your boat holiday in BVI? The islands that make up the British Virgin Islands include Tortola, Anegada, Jost Van Dyke, and Virgin Gorda. Most of the islands possess a varied landscape from volcanic areas to secluded bays. For the more intrepid sailor, there many tiny beach coves in the British Virgin Islands that have no name that is best reached by boat. Sail in Tortola: The largest island in BVI, Tortola is the most popular and often the starting point of most cruises along the British Virgin Islands. A favorite sailing hotspot for yacht charters because of its sparkling beaches, crystal-clear water, fresh local seafood, and abundance of opportunities for water sports. The best beaches are found in the northern coast and include: Long Bay, Smuggler’s Cove, Cane Garden Bay, and Lambert Beach are popular anchorages. Sail in Jost Van Dyke: Jost Van Dyke’s White Bay is the unmissable spot in BVI with plenty of palm trees, sunbathing chairs, and world-famous bars like Foxy’s and Soggy Dollar Bar. This secluded and gorgeous bay boasts a half-mile white sandy beach and reefs close to shore that makes it a great place for underwater exploring while chartering in the BVI. This spot is very popular for those cruising the BVI on catamarans and a favorite destination for New Year’s Eve. Sail in Anageda: Anageda’s coral atoll offers amazing underwater views for divers and snorkelers to explore many sunken shipwrecks and a spectacular range of tropical sea life. Anageda is also a fishing hotspot and the best spot to feast on freshly caught lobster when your yacht charter in BVI. Sail in Virgin Goda: One of the most famous tourist attractions for charters in the British Virgin Islands is Virgin Gorda’s world-famous Baths National Park. This pristine park was declared a national heritage in 1990 and provides grounds for adventurous seafarers interested in snorkeling and a fully-equipped marina (with Wi-Fi). Do not miss the dramatic rock formations of The Baths’ beach whose immense boulders, grottos and natural pool, is an unequaled snorkeling experience. After departing The Baths, head to Norman Island, the famous model for ‘Treasure Island’, where you can let your imagination loose with tales of pirates and treasure caves. Salt Island: The Wreck of the Rhone is the first and only Marine National Park in the British Virgin Islands located on Salt Island’s Lee Bay. It is the most celebrated dive site in the BVI, and as a top 10 wreck dive in the world, it is a major recreational attraction. This fascinating Caribbean nation is just 90 miles south of the U.S. coast, but once you arrive in Cuba you are transported to a magnificent far away land. With beautiful colonial architecture, endless idyllic beaches, rich tropical landscape, an extraordinary culture, sailing in Cuba is unlike anywhere else on Earth. The atmosphere and people of this island nation will blow you away as soon as you lower anchor. With the recent lift of the U.S.’s travel embargo, there has never been a better time to book a sailing holiday in Cuba. A favorite sailing spot, Cuba’s ‘Pearl of the South’ is a nautical city founded in 1819 which was declared a UNESCO World Heritage Site in 2005. Sitting in a beautiful natural bay, Cienfuegos has a laid-back nautical feel sprinkled with French flairs. Cienfuegos also boasts excellent marinas that make it the perfect spot to set sail from or lower your anchor. Book a yacht charter in Cienfuegos. The wild beach at Cayo Jutias is famous for snorkeling, turquoise waters and giant starfish. While Punta Perdiz is sheltered inside the famous Bay of Pigs its 100-meter-long reef is a famous spot for divers. Do not hesitate to rent a boat in the Bahamas - it's worth it. Made up of more than 700 coral islands, marine-rich dive sites and fine dining opportunities it’s easy to see why the island-nation makes such a great destination for Caribbean sailing and cruising. Each island will yield unforgettable discoveries of its own where you can expect relaxation in blissful surroundings and brilliant conditions for water sports and island-hopping through the Bahamas. Thanks to the calm waters and their proximity to each other the best way to experience the diversity of these islands full of promise is by renting a boat in the Bahamas. With more than 150 boat rentals available you can choose from a wide variety of options to rent a boat in the Bahamas: motor boats, sailboats, and catamarans are all great options in the Bahamas. Conditions in the Bahamas are also brilliant for watersports so the entire family and will be kept well-entertained. When to rent a boat in the Bahamas? One of the greatest things about the Bahamas is its excellent year-round sailing conditions. Couple this with its proximity to the east coast of the US (only 50 miles from Florida) it’s not surprising that the Bahamas is a great destination for a Caribbean boat rental. Where can I rent a yacht in the Bahamas? We recommend you rent a boat in Nassau, the high-energy capital, and a wonderful place to start your yacht charter in the Bahamas. From Nassau, you can explore 120 miles of sandy bliss in the nearby island-chain of the Exumas. You can also rent a boat from Marsh Harbor, Abaco and Georgetown to discover completely secluded coves and the beautiful open waters. The Caribbean islands are one of the best sailing destinations in the world. Contact the Zizoo Team and book a perfect boat for your sailing holidays!